Plate armour maintenance by Steel Mastery. Set consists of 50 brass rivets. Diameter of head is 8,5mm, diameter of leg is 3mm, lenght is approximately 10mm. Rivets are perfect for plate armour repair, e.g rivetting of plates of brigandine to the fabric base or metal parts' connecting, etc. Set consists of 50 brass rivets. Diameter of head is 8mm, diameter of leg is 3mm, lenght is approximately 10mm. Rivets are perfect for plate armour repair, e.g rivetting of plates of brigandine to the fabric base or metal parts' connecting, etc. Set consists of 50 figure rivets. Diameter of head is 5-6 mm, lenght is approximately 1 cm. Rivets are perfect for plate armour repair, e.g rivetting of plates of brigandine to the fabric base or metal parts' connecting, etc. Set consists of 50 brass rivets. Diameter of head is 5-6 mm, lenght is approximately 1 cm. Rivets are perfect for plate armour repair, e.g rivetting of plates of brigandine to the fabric base or metal parts' connecting, etc. 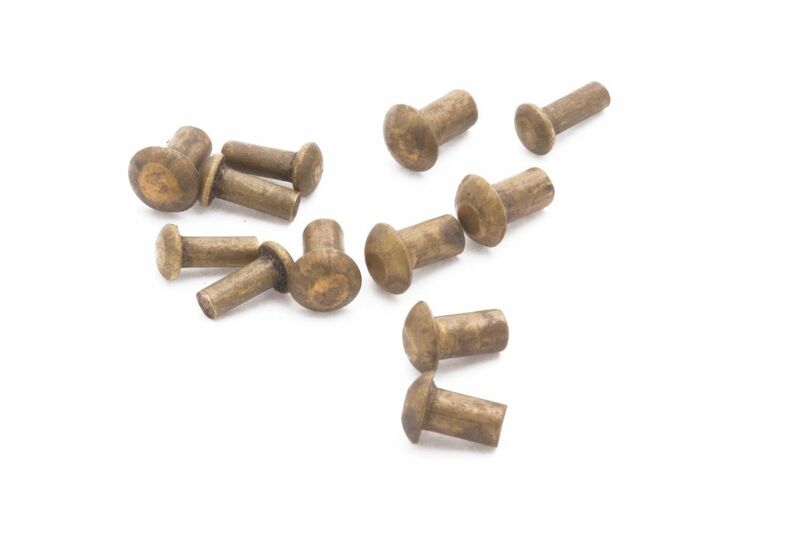 Set consists of 50 rivets of normal steel Diameter of head is 5-6 mm, lenght is approximately 1 cm. Rivets are perfect for plate armour repair, e.g rivetting of plates of brigandine to the fabric base or metal parts' connecting, etc. Set consists of 50 brass rivets. Diameter of head is 10 mm, diameter of leg is 4mm, lenght is approximately 8 mm. Rivets are perfect for plate armour repair, e.g rivetting of plates of brigandine to the fabric base or metal parts' connecting, etc. In the Middle Ages, every self-respecting knight had to take care of proper condition of armour. Besides, body protection had to have perfect look. So, handling of armour required efforts. Because armour had not only got dents and holes, but also was fading on the sun and losing its shine. Moisture and rust also led to damage of defense. It was affected by rain, fog, change of climate, etc. However, even if weather was good enough, inner side of helmets, cuirasses and other parts of armour was getting rusty rather fast. That was happening because of sweat. Armour often went bad just because of this inner wetness. Modern reenactors and fans of medieval fencing meet the same problems. Handcrafted plate armour is expensive enough and manufacture of it takes a lot of time. So, due care and up to date repair are necessary actions. Professionals recommend painting of the inner side of plate armour. Paint protects metal surface of sweat and corrosion. Especially, it is very important to treat inside part of visor, as exhalant condensed vapor constantly accumulates on it. There are also special corrosion-preventive compound, which should be used for armour polishing before tournament or bohurts. Quality and reliability of brigandine armour is defined by rivets’ condition. The power of blow is spread evenly and amortized well, if all rivets are at place. If even one rivet is missed on plate, pressure on the rest of rivets grows up by times. Plate with few missing rivets can be easily bent, so it will make owner of brigandine with such plate very assailable. In this case, it is necessary to add rivets or change damaged one as soon as possible.